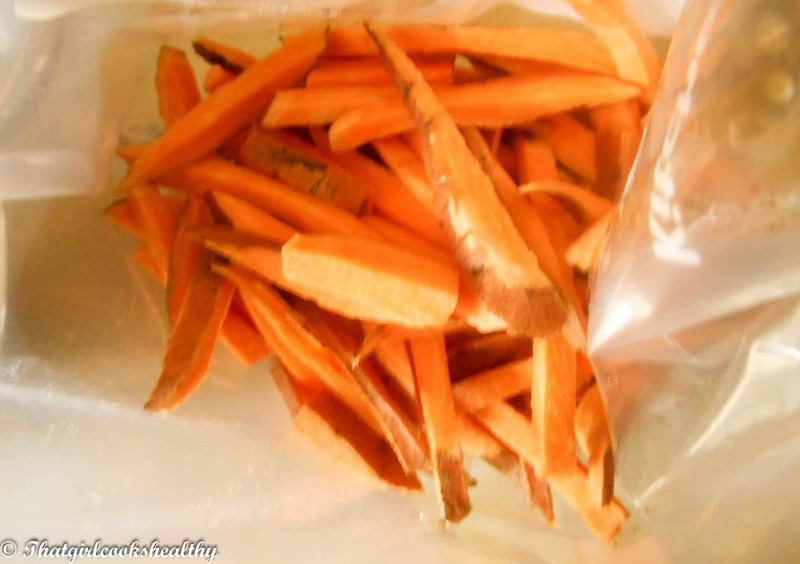 Oven sweet potato fries – love fries but hate deep fat frying? 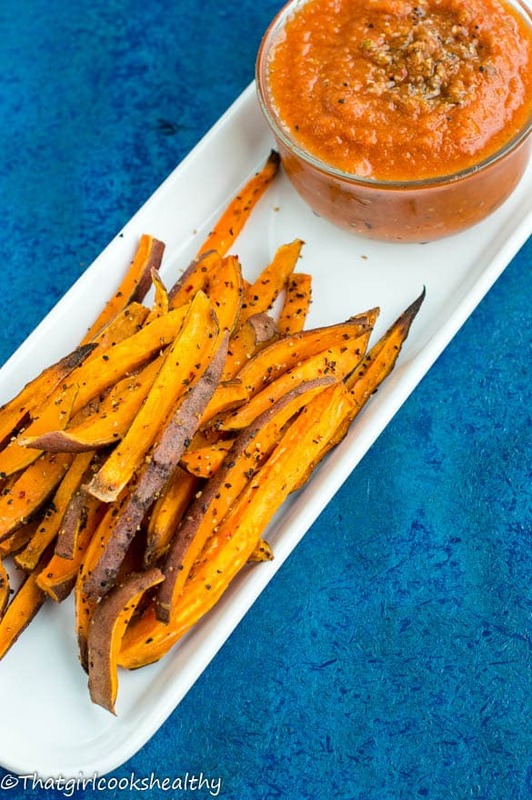 No problem these sweet potato fries are so healthy thanks to the oven baked cooking method. French fries are huge amongst the national and there’s no escaping it. Everywhere you go, you’re guaranteed to find an establishment that sells fries or chips as we call them in my corner of the globe. Children and adults love the taste a like and the sad thing about fries is that most fast food restaurants deep fry the potato in trans fats. Trans fat is formed when vegetable oil goes through a chemical process called hydrogenation, this process makes the oil more solid at room temperature. Trans fats are widely used in cookies, pastries, short bread etc…apparently they extend the shelf life and enhance the texture of food. Extreme consumption of foods with trans fat could lead to high cholesterol, atherosclerosis – a build up of fat deposits called plaques formed in the main arteries, stoke or even a heart attack. It’s really quite threatening to think about how exposed we truly are to such bad fats, yet most of us remain ignorant to what’s in our food let alone the cooking method. 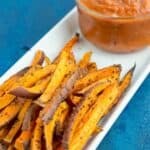 Homemade sweet potatoes fries are far healthier than what you’ll find in a fast food establishment. This starchy crop is loaded with plenty of fibre, vitamin c, a and an abundance of minerals. 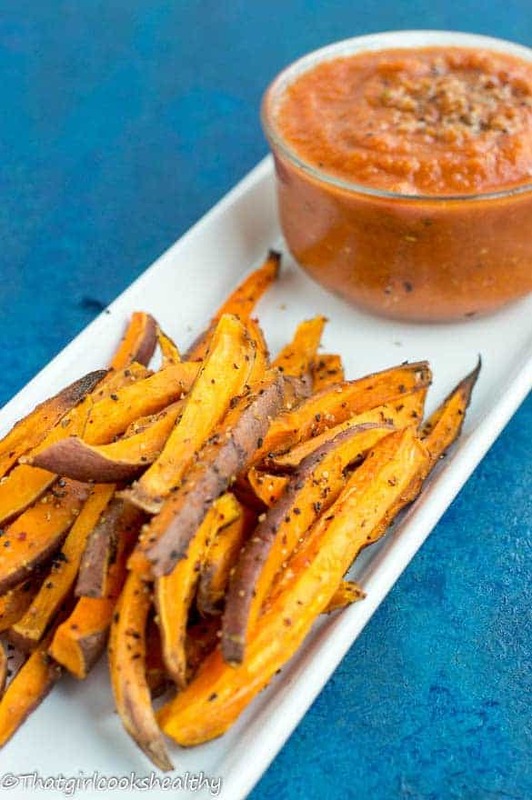 I made these oven sweet potato fries with some herbs and spices to add a subtle twist. If you search the internet you’ll find many recipes without seasoning. However, I wanted to get really creative and change this dynamic – black pepper, sweet paprika, himalayan pink salt, mixed herbs and coconut oil. The fries were cut into thin strips (lengthways). Extra thin slices are prone to shrinking during cooking, in this case it’s better to overestimate the amount of potatoes needed, I used 3 potatoes which equalled approximately 2 servings and left the skin on for extra fibre. The finished result – enjoy! Cut the sweet potato length ways, so that they look like long french fries. 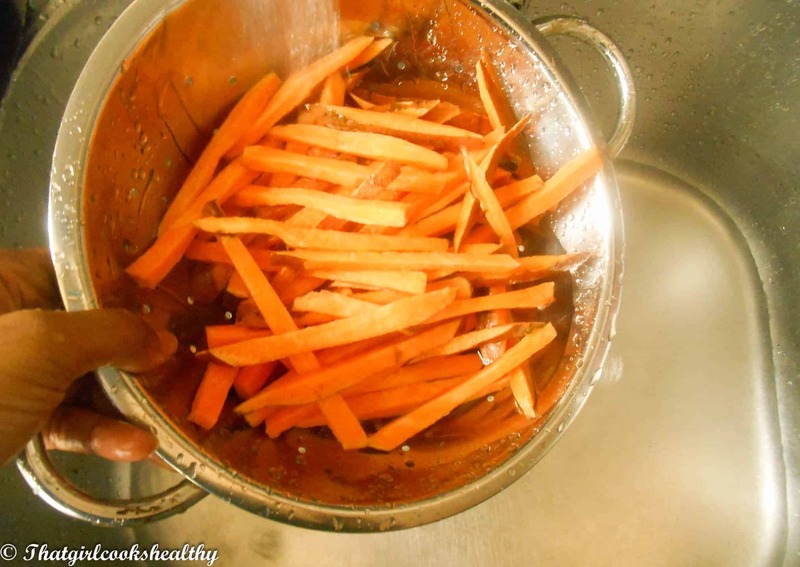 Wash off the sliced sweet potatoes in a colander and blot excess water with paper towel. Add the oil, herbs and spices, potatoes to a zip bag and shake well. Line a baking tray with parchment paper and transfer the spiced potatoes onto the lined tray. Spread out evenly, ensuring that they don’t overlap. Cook for 20 -30, until golden brown and crispy….turn frequently throughout cooking stage. Can use zip bag or a tray for marinating stage.